Can I Legally Cut Down My Neighbor’s Dead Tree? You cannot cut down a dead tree that is situated on your neighbor’s property without your neighbor’s consent. If you do so, you might find yourself subject to a lawsuit under the Illinois Wrongful Tree Cutting Act, 740 ILCS 185/0.01 et seq. The Wrongful Tree Cutting Act provides successful litigants treble damages (3x value) for the “stumpage value” of a wrongfully cut tree, as determined by an appraisal. Stumpage value means the value of the standing tree. What Can I do If Their Branches Encroach On My Lawn? However, you can trim up to your property line the branches which hang over your property line of a tree planted on your neighbor’s property. Trees limbs or roots which encroach on your property can be removed whether or not the limbs or roots have caused you any actual injury. Bandy v. Bosie, 132 Ill. App.3d 832, 477 N.E.2d 840 (4th Dist. 1985). However, you might not be so lucky if the tree trunk is on your property boundary line. Trees whose trunks are situated on a property boundary line and shared by two or more adjoining landowners are considered owned by all the landowners as tenants in common. Ridge v. Blaha, 166 Ill. App.3d 662, 520 N.E.2d 980 (2nd Dist. 1988). The practical effect is that if one landowner tries to cut down the tree, one of the other landowners can file a lawsuit to stop it. What Are My Options If The Tree Trunk Is On The Property Line? After reading all this, you might be asking what you can do if a tree has its trunk on your property boundary line or if a dead tree on your neighbor’s property is threatening your property. You really have two options: (1) self-help (cutting down the tree and seeing what the consequences are), or (2) negotiating with the adjoining landowner to get permission to cut down the tree or pay for the adjoining landowner to cut down the tree themselves. I do not recommend option 1, as it may result in unintended, expensive consequences such as a lawsuit or even property damage. The best way to handle the situation is to pay for the other landowner to cut down the tree or get their written consent to let you do it. Ideally, the other landowner will just let you pay for it, or will pay for it themselves. They can and should take on any liability associated with the tree removal. If the other landowner is unwilling to do it themselves, you can ask them to sign a waiver and consent allowing you to hire someone to chop down the tree. Doing things this way, you are taking on some of the third-party liability risk. However, if the tree is threatening your property, the risks associated with removal might be greatly outweighed by the reward of removing a tree that is about to fall onto your property. The best way to mitigate any potential third-party liability risk is to make sure you hire a tree removal expert who is insured and bonded and can pay for any damage they cause. 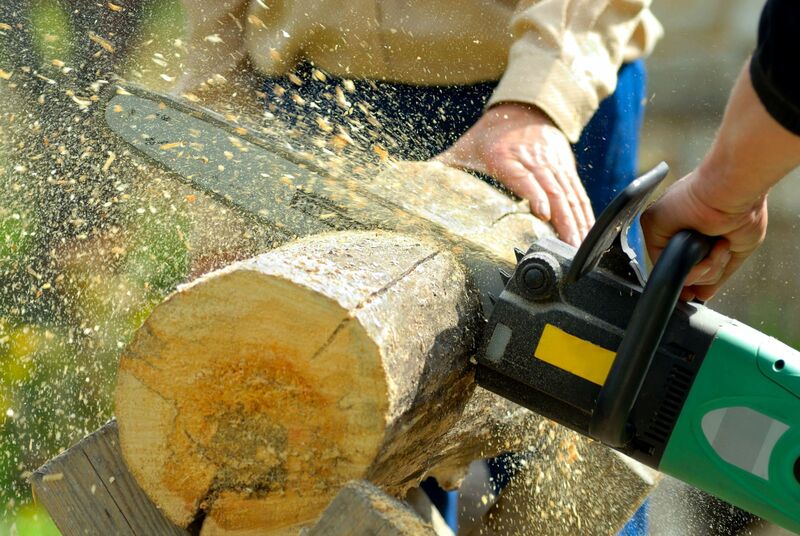 Ask for proof of insurance and bond information before you hire any tree removal expert.